55087 - 3mm, 10mm, 15mm & 25mm Single Satin Ribbon with Lurex Edge! 88160 - 15mm Light Coloured Lurex Mesh x 10 Metre Rolls! 46024 - 15mm & 25mm Wired Lurex Square Ribbon x 10 Metre Rolls! 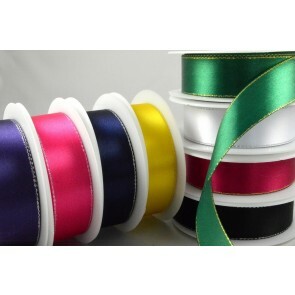 44111 - 25mm Wired Coloured Ribbon with Woven Thread x 20 Metre Rolls! 77011 - 6mm Lurex Zig Zag Design x 10 Metre Rolls! !